As the world is within the thick of transitioning from ancient land-based telephone lines to for the most part wireless communication devices, there is a terribly real want for interim solutions -- product to assist users move from recent phone systems to new ones. 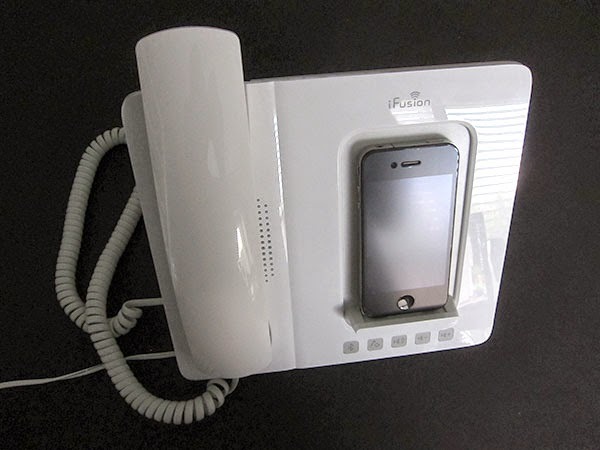 Altigen's iFusion SmartStation ($180, aka AP300) is one amongst those helper product, a shiny white and grey desktop telephone that lets home or business users fancy the comforts of a conventional desktop phone whereas investment the wireless capabilities of an iPhone 3G, 3GS, or 4. iFusion includes the phone, a loud phone, and an area to optionally charge your iPhone; the iPhone is responsible for the cellular voice service and the dialing mechanism. And whereas we actually liked what most of iFusion does, the charging and dialing options may have used just a little extra work. One factor that Altigen extremely got right with iFusion was the commercial style, that errs on the facet of familiarity and luxury instead of making an attempt to switch everything with postmodern shapes. From the front, the unit appears like a white rounded rectangular box with nice bevels and obvious buttons; the phone is splendidly arced to feel substantial and soft within the hand. From the side, iFusion is clearly tapered, using matte grey plastic and a considerable metal stand that holds the phone and speaker upright, making a roughly 6” deep and nearly eight.5” tall structure that’s rubber soft for general stability. a small compartment on the rear manages audio, mini-USB, power, and phone cables while not creating all of the wires flow all over the place; it’s no little compliment to mention that everything looks nice and feels very professionally designed. this is often a far smarter, nicer style than Kee Utility’s phone Dock, that we have a tendency to reviewed some months past. While we’ve seen lots of iFusion’s functionality in earlier Bluetooth and non-Bluetooth phone accessories, none has brought everything along as well as Altigen has here; it’s worth noting that you’re not needed to attach your iPhone to the present unit via any kind of physical connection. within iFusion may be a Bluetooth 2.1 chipset for each mono telephone and stereo audio streaming, each handled through 2 speakers—one is within the phone, and therefore the alternative is immediately behind the phone in an attractive-looking dot grille on the 8.8” wide by 7.8” tall matching base. whereas only 1 speaker operates at a time, and iFusion’s base speaker won’t activate unless the phone (or one thing else) is holding down a button within the phone cradle, every mono speaker’s peak volume level is incredibly loud: the phone speaker is louder than the ear speaker in any iPhone, and therefore the phone is way louder and clearer than the one engineered into the iPhone 4’s bottom. microphone performance may be a hint superior on the iFusion’s phone than on the iPhone 4’s, however alittle less clear on the iFusion’s phone side than on the iPhone 4’s. Handset aside, the key distinction between iFusion and, say, Uniden’s BTS200 is that the presence of an oversized charging dock over to the correct side of the unit. On a positive note, this dock is nicely placed, and sits right higher than a panel of 5 light buttons: Bluetooth pairing, muting, phone on/off, volume down, and volume up. By inserting the dock so near the phone, Altigen makes it straightforward to dial variety by simply turning on the docked iPhone’s screen or using Voice management on recent models—assuming the iPhone’s sitting on the dock. But if the iPhone’s not on the dock—and it may well not be if you’re using a case, since the dock hasn’t been designed to accommodate most cases—dialing could also be a pain. For no matter reason, Altigen doesn’t embody a button to remotely activate the iPhone’s Voice management options, that most rival phone and phone product do include, thereby sanctioning you to merely speak a name or number and begin talking. Altigen additionally doesn’t embody an influence button for iFusion, therefore the unit stays turned on, awaiting pairing, because it uses up wall power with an enclosed power adapter. Contrast iFusion’s approach with the same Uniden unit, that offers nice phone, integrated battery pack, and USB charging port options at a cheaper price point. BTS200 does a better job with stereo music streaming due to its twin speakers, too, though you have got to self-supply the iPhone charging cable, and don’t get a handset—just the phone and charging practicality. In alternative words, what Altigen is making an attempt to do with iFusion is completely different. tho' it includes streaming support and works well as a phone, it’s really making an attempt to copy the classic desktop telephone, and in most ways that, it succeeds: each for radiation and sonic reasons, we legitimately preferred using the phone to holding an iPhone up to our ears, and therefore the speakerphone’s volume and ease of use are each definite commerce points for those searching for a louder telephone line choice. With a really modest modification to the dock—a taller and therefore more case-compatible Dock Connector—and a built-in Voice Control-activating button for simply creating calls while not an iPhone immediately nearby, this new phone would live up to its full potential as a transitional answer for fans of desktop phones. As-is, tho' it’s alittle bit more expensive than it ought to be, it’s adequate to earn our general recommendation, and deserve thought if you’re willing to adopt its understood usage model.